You’ve seen the photos, all of the photos now of Chanel Cuba Cruise, haven’t you? It’s the most beautiful Chanel collection, ever. I’m not being very subtle. So I’ll be even more obvious: Chanel is my favorite design house. There’s nothing in this fashion world that I could ever love more than Chanel. Yes, I gush over Isabel Marant daily. Yes, I love my Bella Freud sweaters. But there’s this insanely beautiful high that you get when you buy something from Chanel. It’s indescribable. This feeling of elation, pride, and prestige. Just sheer style joy. You don’t get that from any other designer. Most of my Chanel flats have been the classic colors, the Chanel slingbacks are also timeless, and the three Chanel bags that I have are also in colors and leathers that will never go out of style. But truth be told, I’ve never veered away from Chanel classics. This was going to be the collection that broke me out of my Chanel staple shopping and pushed my summer style, wasn’t it? So, what did I get from this collection? My Chanel boutique didn’t get the white crochet bag that I had lusted over. 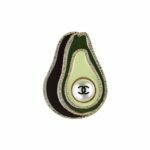 They also had either sold out of the avocado pin or never received it. The black grosgrain, slide on, Chanel mule sandals. With silver stars with “pearls’ in the center… They were dreamy in the photos. I made the mistake of trying on these mules. And they were even dreamier on. They didn’t have my true Chanel size, 39. So I tried on a 39.5. A pinch bigger than I would like. But they still looked amazing. The mules looked like beautiful embellished ships on my feet. In the best way possible. NOTE: These Chanel mules fit true to Chanel size. Even though I sized half a size up, DO NOT DO IT if you can help it. They have this 90’s hint when you see the 1.4” block heel, but straight on they looked almost like gladiator sandals. I remembered the Edinburgh collection and Dallas collections that I had passed up, bit the bullet, and handed over my bank card. A week later and no regrets. At all. These mules are everything that I wanted from a new ~fancy~ sandal. They look really good in black. With an all black outfit they stand out because of the silver stars. I have strappy shoes that take forever to put on and off. These just glide right on! At 5’5.75, a light heel is ideal. I don’t like being TOO tall, but I also like a little heel on my sandals to make my legs just a little bit longer. These accomplish that. E.g. standing next to a tall boy, I feel taller and more confident. And standing next to a medium sized boy, I can still feel adorable. In grosgrain, these Chanel mules were not as expensive as the leather pairs. They cost $1,095 v.s. $1,395 for the silver leather version. And in my opinion, the grosgrain is more appealing because they give the silver stars centre stage to shine. If you’re looking for a sandal that works for you with dresses, jeans, or shorts, this is it. 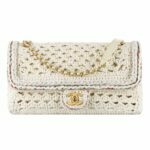 Available from Chanel boutiques for $1,095, here are the details. How Does It Look On? Adaptability: They’re evening shoes, so not entirely adaptable to daytime, but I’m sure I could find a way. Comfort: Super comfortable, no complaints. Durability: The grosgrain material is not fussy and dirt can easily be brushed off. However, a few weeks into owning them, I accidentally knocked off one of the pearls. I’m not a strong person or anything and it wasn’t a hard knock… Devastating. BE CAREFUL. How Does It Look On? They look amazing on. True to Pictures? Exactly like the pictures.